No recipe today. Instead – a great household tip; great not just for your kitchen, and so so easy to make yourself. So I turned to my beloved water and vinegar solution once more – and I’m loving it even more than my beloved non-toxic spray cleanser. In fact, I might never buy another spray cleanser again. Just a spray bottle filled halfway with vinegar (I’m pretty sure that everyone has a bottle stashed somewhere in their pantry) and another halfway with water. And voila – a cleanser that’s gentle on your household dwellers, the environment, and your wallet. If only I was this ingenious in every other way. What’s next – homemade facials? Update: a few readers are sharing their tips on using vinegar at home. What’s yours? Let’s share and then I’ll repost the original post with all the updates! Vinegar is also a great fabric softener. You can add some to your laundry and it comes out super soft without chemicals (and no vinegar smell, I promise). Years ago, my friend told me how household cleaners had made her grandmother briefly forget where she was (too much fumes), so ever since then I’ve stopped with the chemicals. Vinegar & water is great & use can use a few drops of essential oil for a better scent. But my favorite tip is for removing bathtub grime, I always use baking soda + vinegar + a bit of liquid soap to form a paste. It works really well and so much better than chemical cleaners. 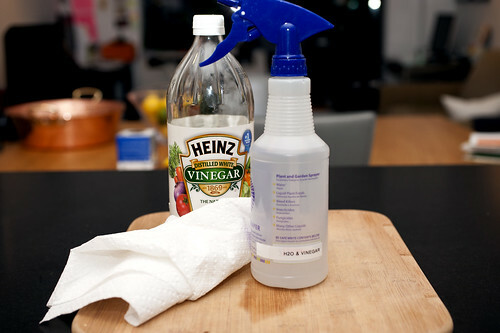 I’ve used vinegar as my fabric softener ever since! Lots of other good tips there too.